My 6" Round Nantucket Basket, one of the most requested sizes for use as a bride's basket and for her bridal party. This Nantucket Basket also is fashionable as a special keepsake gift basket or as an anniversary gift basket. Traditional hardwood Nantucket basket swing handle attached to this Nantucket basket with bone knobs and washers. Ivory and colorful ivory scrimshaw knobs are also available. The finish consists of multiple coats of hand-applied varnish, applied to both the inside and outside of the basket. This brings out the full beauty of the natural materials, and helps to protect and strengthen the basket. All the hardwood parts are given even more attention to protect and burnish, bringing them a deep luster which is glass-smooth to the touch. These, and many other fine details, set my Nantucket baskets apart from all others. 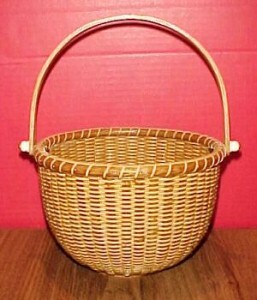 This popular Nantucket basket measures 6.5" diameter, 4.75" high and 8" high at handle. Although I am no longer accepting orders for the Nantucket Basket 6" Round, I do craft a few of these per year. When available for sale, you can purchase it directly from my Simply Baskets website.